There seems to be this idea out there that kids will not eat vegetables. There are suggestions to disguise the vegetables as trees, or puree them and hide them in the brownies. I just don’t get it. Sure, some kids are neophobes — they will view anything unfamiliar with suspicion. And some kids won’t touch anything green. But I think it’s our job as parents not only to get them to EAT vegetables, in some sneaky and underhanded manner, but to actually get them to like vegetables, as vegetables. That’s going to serve them a lot better in life than never eating spinach unless it’s part of a cupcake. The challenge is in how to do that. And there is no answer that works for every kid. Try different things. Prepare vegetables in different ways. Try roasting them, or sauteeing with a little bacon, or serving a salad, or baking into a lasagna. Let them dip the vegetables in ranch dressing, or cover them with a cheese sauce. If they don’t like green vegetables, cook carrots or cauliflower or pattypan squash. Make vegetables, in all of their wondrous variety, a part of their life. Before you run screaming for the hills, don’t think that the Nuni is sitting there saying “How about some cardoons for Sunday brunch today, Mom?” She’s not a great eater in general in terms of quantity, and macaroni and cheese or ice cream tend to be more successful than bell peppers and eggplant. (And I fully admit that there have been nights when dinner WAS ice cream, ideally washed down by a vitamin and some green juice from Trader Joe’s (that stuff is magic — it looks like pond scum, but tastes like bananas and mangos, and has things like spinach and seaweed in it). But I keep trying. I serve her the veggies she’ll reliably eat, like carrot sticks and raw broccoli, and I keep trying new preparations on her. And occasionally, I hit gold. Last week we were driving home, carrying on our typical patter “Who did you play with today? What books did you read? What do you want for dinner?” (the answer is usually “Macaroni and cheese, because that’s a dish she remembers), when she suddenly piped up “I want kale for dinner.” Kale? My child wants kale? Not one to miss an opportunity, I stopped at the Whole Foods on the way home to pick up some kale, and rushed when I got home to prepare these kale chips. I don’t know what genius had the idea to basically dehydrate kale in the oven, but our household has cause to be thankful this winter. 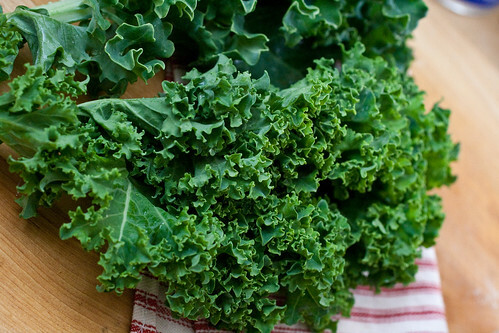 Kale, with its curly, almost crisp texture, bakes up into addictive, crunchy chips, that shatter when you bite into them. And they’re completely simple to make — remove the thick central veins, tear the leaves into bite sized pieces, toss in a little oil and vinegar, and bake for about 15 minutes. The only challenge is getting them uniformly crisp, but I actually like the texture variations when some are chewy and some are crisp. Finally, I finish them with a little sea salt and furikake, whose seaweed sesame flavor compliments the kale perfectly. With vegetables like these, who needs to hide them? Prepare the kale: Remove the central vein from each leaf and tear the kale into bite sized pieces. In a large bowl, combine the oil and the vinegar. Toss the kale in the vinaigrette and spread on a baking sheet, lined with foil. Bake until crisp, about 15 minutes. Season with salt and furikake. I had such a proud moment this week when Z asked if she could bring leftover roasted cauliflower into school for her morning snack. I know those dark leafy greens are super-foods, but I have trouble using them other than in soup. I will have to try this. unfortunately, your losing most of the nutrients by cooking it. Even a light steaming strips nutrition. However if we could find a way to do both, THEN we’d be in business! 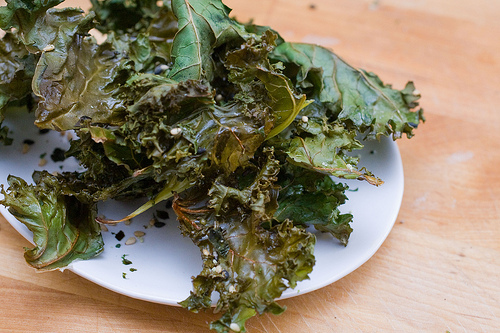 Whenever I see someone post kale chips, I always say I want to try making them. This time, I’m literally making a note on my calendar right now to make these. Looks so good and healthy! I completely agree to get kids to love vegetables as vegetables, and by god…whoever thought of making kale chips need an award. Kids love chips…crunch and all. I don’t have kids, but I still remember being one picky eater. How cool that she is asking for kale! This must be a winning recipe if she chooses it over mac and cheese! Looks great! I always try to get veggies into my toddler without disguising them soon. I’ve only every been mildly successful, so the more tips the better. I’ll have to try this soon! I love kale chips! I’ve been making them for years. i really need to hop on this kale chip bandwagon! i like that you’ve added red wine vinegar. I am thankful my kids like things like kale, brussel sprouts, and artichokes…still working on eggplant, which is my fav. Love furikake on kale chips! I tell ya, these things satisfy my cravings for any other kind of crispy, high calorie chip. But our son was an avoider of cereals as a baby, again texture…. I refuse to hide vegis, but i have a kidlet that sees us eating them and he has a love for everything but onions! Hoping peer pressure and school does not change his vegi love! Thanks for the recipe these were great. Wonderful idea! 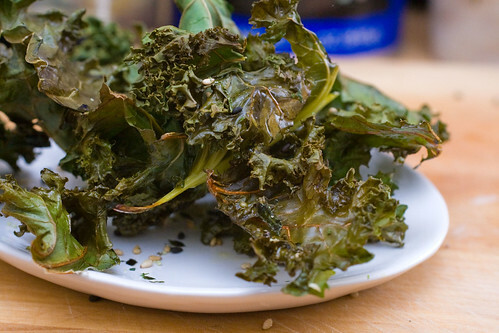 Try these with Lacinato Kale (aka dinosaur kale, black kale, Cavolo Nero, Tuscan kale, black cabbage). It’s ALL good! My kiddie veggie-eating success–give them the veggies separately up front when they’re the hungriest, while waiting for the entree to cool. And ranch dressing is magic, but by now you already know that! Marinated and roasted carrots chips/mushrooms/pearl onions/grape tomatoes/summer squash slices are the current favorite, especially if you let them “help” in the preparation. Sliced canned beets–they beg for them. And I’m totally with you on your “sneaky chef” stance–I think it is absolutely ridiculous to have to fool a child into eating something unhealthy (spinach brownies, etc.) in order to get their vitamins and serves no purpose in long run.